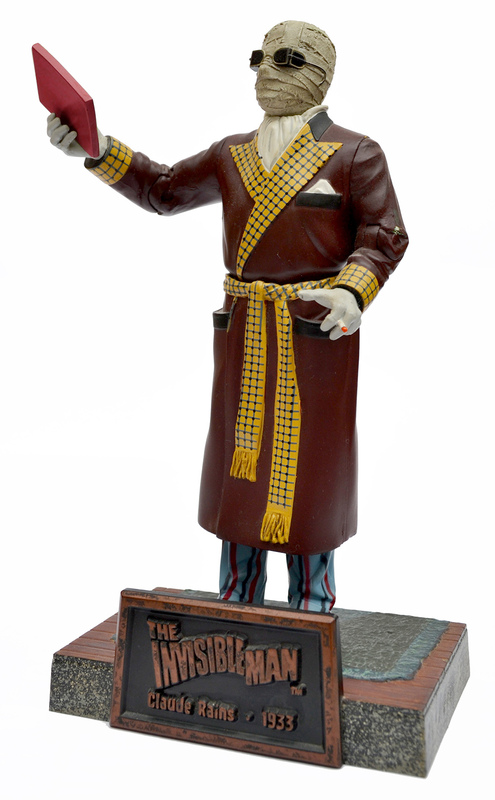 Universal Studios Monsters: The Invisible Man action figure by Sideshow Toy (2000) | 'TAIN'T THE MEAT… IT'S THE HUMANITY! Over the last few weeks I’ve been taking a closer look at some of my favourite action figures, namely the Universal Studios Monsters collection released by Sideshow Toy between 1999 and 2001. 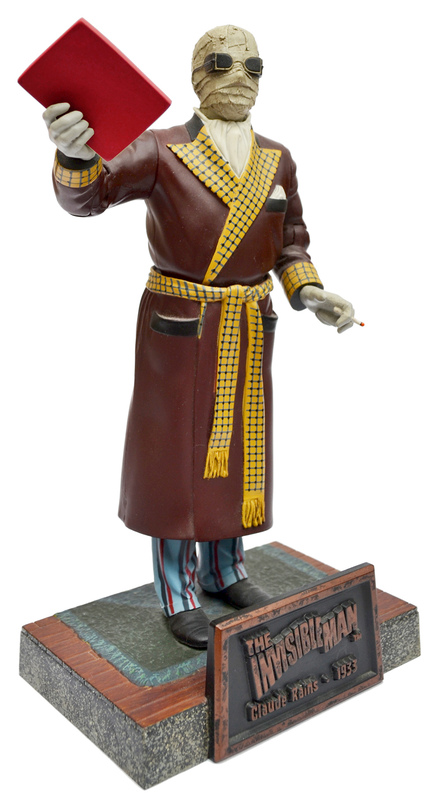 The series featured 15 figures that paid homage to many of Universal’s iconic movie monsters — Frankenstein, The Wolf Man and The Mummy, to name few — as well as the actors who portrayed them. This week it’s the turn of Claude Rains’ memorable performance as The Invisible Man, from the Universal film released in 1933. Directed by James Whale, who also helmed Frankenstein (1931) and Bride of Frankenstein (1935), The Invisible Man was an adaption of HG Wells’ classic science fiction story, originally published in 1897. The story tells of an insane scientist, Griffin, who turns himself invisible and wrecks havoc on a small English village. After terrorising the locals the murderous Griffin is eventually mortally wounded, and only at the moment of his death does he become visible again. The Invisible Man was a hit for Universal and proved to be their most successful horror film since Frankenstein. 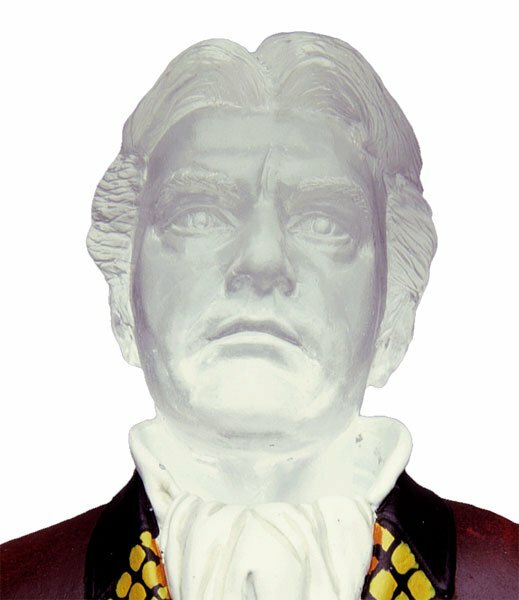 The film’s success was due in part to Whale’s skilful direction, Rains’ indelible portrayal of Griffin (no mean feat since he only appears on screen at the very end of the film), and the special effects, which were groundbreaking for the time — the scene where Griffin peels of his bandages to reveal his face (or lack of) wowed and thrilled cinema audiences. 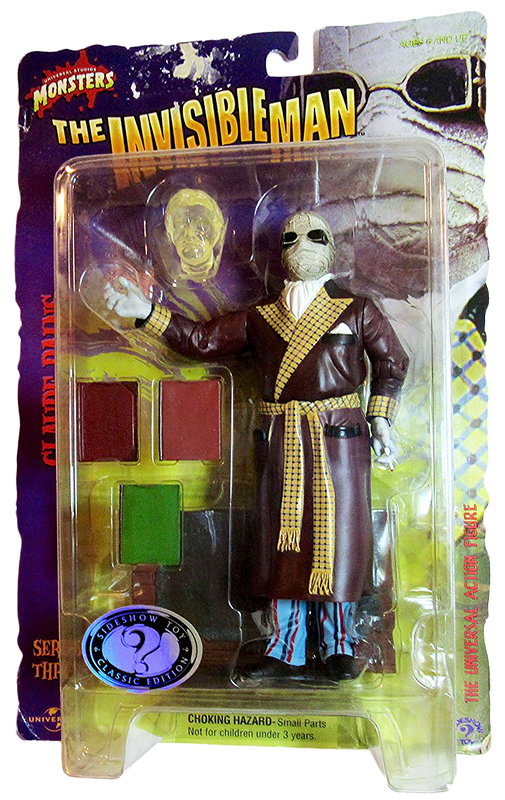 Released by Sideshow Toy in 2000 The Invisible Man formed part of Series Three of the collection (along with The Hunchback of Notre Dame and the Metaluna Mutant from This Island Earth). The figure was made from sturdy moulded plastic, stood nine inches tall when placed on its base and boasted 10 points of articulation. 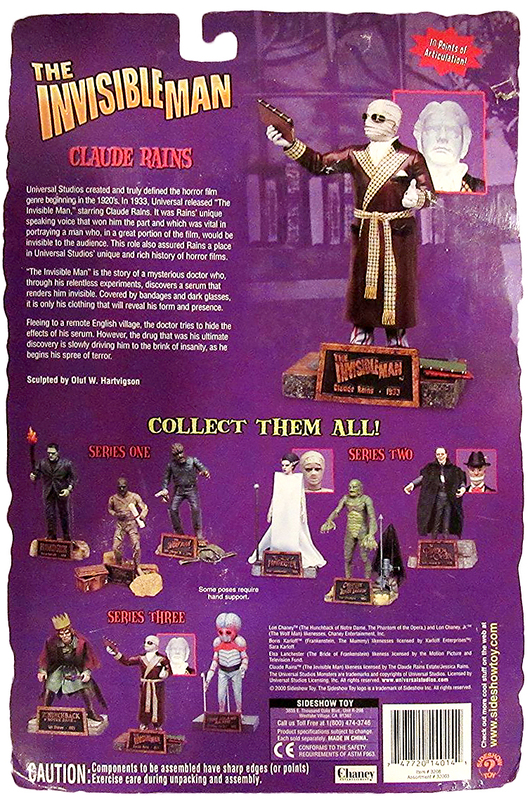 The toy shipped in a cardboard backed blister pack, the back of which featured a short synopsis of the film and showcased other action figures available at the time. The action figure comes with an ‘invisible’ alternate head. 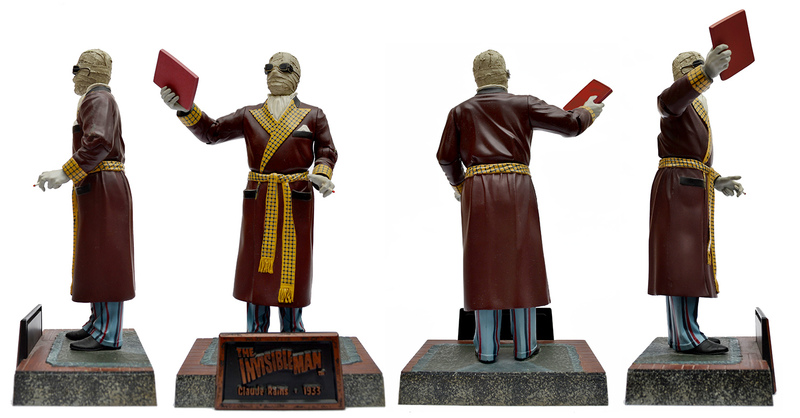 The Invisible Man shipped with four accessories: three books and an alternate clear plastic — or ‘invisible’ — head. Also included was a base with a nameplate that featured the movie’s legend. 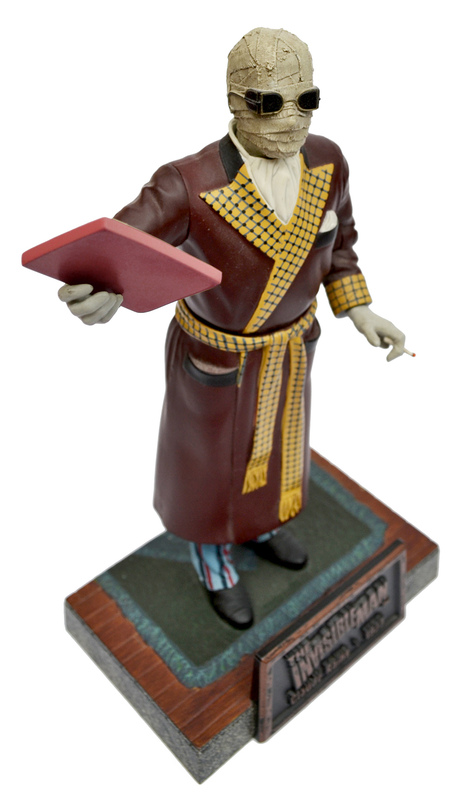 The action figure was based on a sculpt by Oluf W. Hartvigson, who also designed the bulk of the figures from the Sideshow Toy collection. As with he previous work, Hartvigson did a great job interpreting the character. There’s some great detail work on Griffin’s bandages, his glasses and the creases in his clothes. The paintwork on the figure is also very good, especially on the bandages which featured some nice shading and tonal work. Along with his coloured ‘Classic Edition’ Sideshow Toy also released a black and white ‘Silver Screen’ variant. As with all the other figures in this collection I much prefer the colour versions — the black and white versions just look so dull. The Invisible Man, from all sides. Due to its age The Invisible Man is well out-of-stock, and BNIB copes can easily set you back anything from £50 to £150, when you can actually find one that is. It’s a great action figure though, current price notwithstanding, and one of my favourites from the Universal Studio’s Monsters collection. The Invisible Man has been sitting pride of place on my shelf for almost 20 years now, and it shows no sign of disappearing from my collection anytime soon. I’m just glad I picked up my copy (for £15!) when it was first released.